As someone who has to pay attention to blood/infectious disease issues for work, I’m on a couple email lists that report current issues. I got one of these this week that really caught my eye, with a headline that stated that the incidence of hemophilia appears to be going up. Since hemophilia is a genetic disorder, I was curious why this would be. Clicking on the article, I was surprised to find that the researchers actually believe this is a positive development caused by getting a better handle on HIV and infectious disease standards. For those unfamiliar with hemophilia, it’s a disorder that impacts your blood’s ability to clot. Though in some rare cases women can some forms of it, the disorder is almost exclusively found in men. Men with this require blood transfusions frequently, and thus were impacted when HIV in the 80s before blood and blood donors were screened with the standards we use today. Ryan White, whose case prompted many of the legal protections we have for people diagnosed with HIV today, was one such case. The first person I knew who had HIV (Norm Cataract) was another such case. He was a friend of my parents and dedicated the last few years of his life to giving public talks about how HIV was acquired and trying to reduce fear. It’s hard to remember now, but in the late 80s there was a lot of misinformation about HIV floating around, and with no treatment available it was met with a lot of hostility. I’ve never forgotten Norm’s bravery in fighting for understanding and right information. It’s a shame he didn’t live long enough to see HIV become more manageable disease. Anyway, now that HIV is more manageable, the blood supply is cleaner, and hemophilia is a less risky disease. The less risky it is, the more likely hemophiliacs are to actually live and have children, which given the genetic nature of the disease means there will be more hemophiliacs. In other words, despite the negative connotations of “rates going up”, this is all a good thing. More wounded veterans. Previously more men died on the battlefield or shortly thereafter due to a lack of medical care in the field, now 90% of men wounded in battle survive. Smoking rates (possibly). Working in a cancer hospital, I have a lot of coworkers who (pretty understandably) dislike smokers. I like to remind them that smoking rates are very high among recovering addicts, so we don’t always know if the smoking was a bad choice or a good choice. Smoking isn’t healthy, but I think we can all agree it’s better than heroin. I don’t have a clever name for this, but I’d be open to suggestions! I haven’t done one of these in a while, but recently I saw an excellent example of what I like to call “Praiseworthy Wrongness”, or someone willing to publicly admit they have erred due to their own bias. I like to highlight these because while in a perfect world no one would make a mistake, the best thing you can do upon realizing you have made one is to own up to it. For almost 20 years this questionnaire has been in use in numerous psychological studies, but recently Stanovich became trouble when he noted that several studies showed that being religious had a very strong negative correlation (-.5 to -.7) with open-minded thinking. While one conclusion you could draw from this is that religious people are very closed minded, Stanovich realized he had never intended to make any statement about religion. This correlation was extremely strong for a psychological finding, and the magnitude concerned him. He also got worried as he realized that neither he nor anyone else in his lab were religious. Had they unintentionally introduced questions that were biased against religious people? In his new paper “The need for intellectual diversity in psychological science: Our own studies of actively open-minded thinking as a case study“, he decided to take a look. In looking back over the questions, he realized that the biggest difference seemed to be appearing in questions addressing the tendency towards”belief revision”. These questions were things like “People should always take into consideration evidence that goes against their beliefs”, and he realized they would probably be read differently by religious vs non-religious people. A religious person would almost certainly read that statement and jump immediately to their core values: belief in God, belief in morality, etc etc. In other words, they’d be thinking of moral or spiritual beliefs. A secular person might have a different interpretation, like their belief in global warming or their belief in H Pylori causing stomach ulcers….their factual beliefs. It would therefore be unsurprising that religious people would be less likely to answer “sure I’ll change my mind ” than secular ones. When non-religious people were given generic questions, they scored higher on open-mindedness than highly religious people. When the questions cited religious examples, they continued to score as open minded. However, when the questions changed to specific secular examples, such as justice and equality, their scores dropped. Religious people showed the reverse, however their drop with religious questions wasn’t quite as profound. 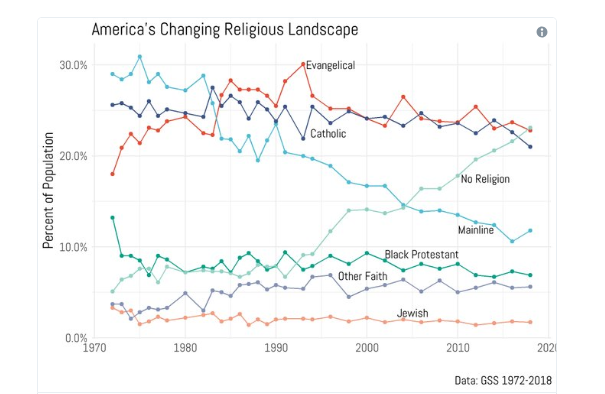 Overall, the negative correlation with religion still remained, but it got much smaller under the new conditions. 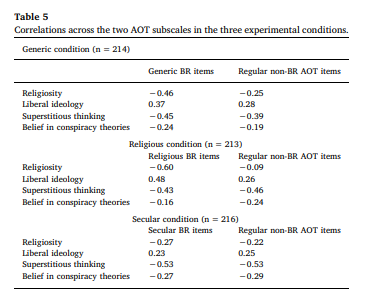 So basically the format of the belief revision questions resulted in a correlation as high as -.60 for specifically religious questions, down to -.27 for secular questions. The -.27 was more in line with the score for other types of questions on the test (-.22), so they recommended that secular versions be used. They correlations fit their biases, so they didn’t question them. They admitted that if religion had ended up positively correlating with open mindedness, they would probably have re-written the test. They believe this is a warning both against having a non-diverse staff and believing in effect sizes that are unrealistically big. While they reiterate that the negative correlation does exist, they admit that they should have been suspicious about how strong it was. Now whatever you think of the original error, it is damn impressive to me for someone to come forward and publicly say 20 years worth of their work may not be totally valid and to attempt to make amends. Questionnaires and validated scales are used widely in psychology, so the possible errors here go beyond just the work of this one researcher. Good on them for coming forward, and doing research to actually contradict themselves. The world needs more of this. Now this struck me as interesting. Our biggest ding was in the one category where they also asked about men’s legal rights, i.e. paternity leave. In other words, the US got marked as unequal under the law because men and women were equal under the law, but in the wrong direction. I can see where they were going with this, but it’s an interesting paradox. I was curious about their justification for putting these laws up there along with the other ones, so I read the explanation they provided. From page 6 of the report: “Women are more likely to return to work if the law mandates maternity leave (Berger and Waldfogel 2004). Though evidence on the impact of paternity and parental leave is mixed, parental leave coverage encouraged women to return to work in the United Kingdom, the United States and Japan (Waldfogel, Higuchi and Abe 1999).” To note, this was the only criteria they included where they explicitly stated the evidence was mixed. 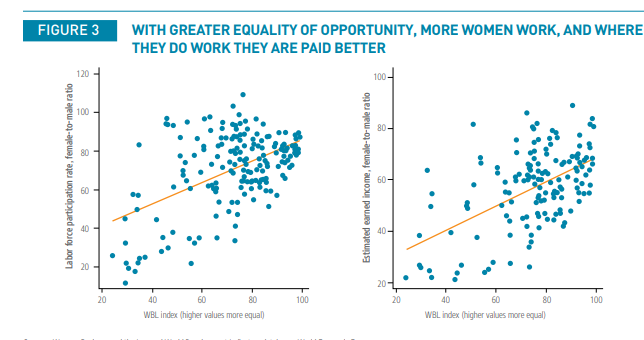 Now as part of this report, the World Bank had stated that legal equality was correlated with equal incomes and equal workforce participation, and showed this graph to support its claim: Now this graph struck me as interesting because while it does show a nice correlation (that they explicitly remind everyone may not equal causation), the correlation for countries scoring above the mid-70s is much less robust. While workforce participation for women in countries earning a perfect score is very high (left chart), it’s interesting to note that the pay ratio for men and women in those countries goes anywhere from the 50 to 80% range. I looked up the individual numbers for the 6 countries getting a perfect score (Belgium, Denmark, France, Latvia, Luxembourg and Sweden) and the US, and found this. The labor force participation ratio and the F/M pay ratio are from the reports here. I added the other metrics they put under “Economic Opportunity and Participation” just for fun. So out of the 6 countries with perfect scores in legal equality, 2 have overall economic participation/opportunity scores higher than the US, 1 is equal, and 3 are lower. Many countries that have high scores end up with high numbers of women in the workforce, but low numbers in positions of power (2nd and 3rd rows from the bottom). The US and Latvia led the pack with women in higher profile jobs, even with the US having (relatively) low workforce participation. Oh, and in case you’re wondering how Luxembourg got a perfect income ratio score but not a perfect equal pay score: incomes for the ratio calculation were capped at $75k. Luxemborg has a very small population (600,000) and a very high average income (about $75K), so it really kinda broke the calculation. Including incomes above $75k would probably have changed that math. Now, I want to be clear: I am not saying legal equality isn’t important. It is. But once you get beyond things like “are women allowed to legally go out at night” and in to things like “do pensions give explicit credit for child care”, the impact on participation is going to vary a lot. Different cultures have different pluses and minuses, so the same culture that gives extensive maternity leave may not end up encouraging women to go for the highest professional jobs. In cultures with low relative incomes like Latvia, women may use their legal equality to get better paying jobs more often. This confirms the pattern we see in engineering and science degrees….the most gender equal countries are not the ones producing the most female science grads. Still, the hardest thing about calculating equality is probably relative income. While Latvia may have more women in higher level jobs, most women would prefer the US average income of $43k to the Lativian $20k. While many of the other top countries are OECD countries, some of the ones scoring the same as the US were not. Even with equal legal situations, I’d imagine that life for women in the Bahamas, Kenya, Malawi and the US are very different. That doesn’t make the metric wrong, it just means equality can be very different depending on where the overall median is. One final thought: it struck me as I was researching these countries exactly how big the US is in comparison. If you add up the populations of the 6 countries with perfect scores, you get about 96 million people. This is less than a third of the 325 million people who live in the US. Large countries tend to be less equal than small ones, and I do wonder how much of that is simply supporting a large and disparate population. The US is the third largest country in the world by population, and the first one with a higher legal equality score than us is #10 on the list, Mexico with 38% of our population and a score of 86.25. The next one to have a higher score is #17 (Germany) then France. 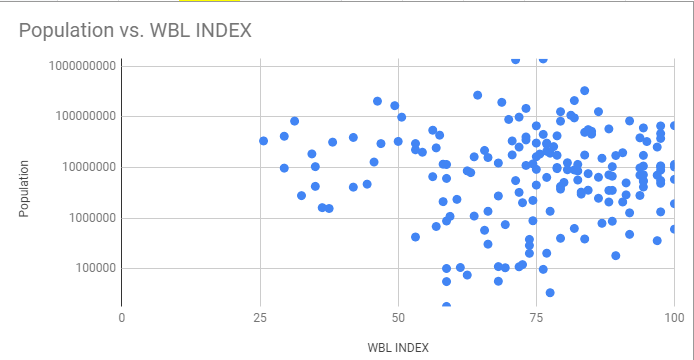 To test my theory, I put together a graph of population size vs WBL index. Note: it’s on a log scale because otherwise China and India just kinda dwarf everything else. So basically no country with a population over 100 million has gotten over a score of 86. Speculating on why is a little out of my wheelhouse, but I think it’s interesting. And with that I’ve gone on long enough for today, but suffice it to say I find global statistics and inter-country comparisons fascinating!